Aurora Optima Sole with medium nib. A yellow pen, an orange ink, and we’ve warmed up a cold March day. Thanks to a friend, I’ve got a sample of Montblanc’s limited edition Lucky Orange ink to try. It’s darker than I expected, and bright but not eye-searing. Very easy to read, even from a medium nib. Only a little shading. An excellent orange ink. Ink Dips is a more casual, laid-back ink evaluation than is normal here at Fountain Pen Follies. Instead of carefully evaluating an ink I’m interested in, the point of Ink Dips is to blindly pick an ink sample from a box of the set-aside or soporific. Then I fill that sample in one pen and see what I think. It’s an inky experiment that’s a bit dippy. Lamy Black. This was a surprising black ink, very dark, very lubricated and wet-writing. It’s a boldface black ink. It may be a good choice for those who seek “the blackest black” but also want to use a low-maintenance brand of ink. Here we go: Aurora Blue Black, size large. We’ve already seen Aurora Blue Black in a (normal to me) Aurora Optima with fine nib. And from the wispiest of nibs, a Lamy 2000 extra-fine. To see what Papa Bear makes of the ink, I pulled out a Montblanc with broad nib. Aurora Blue Black. This new ink seems like a winner: it’s a darker blue black, with nice shading, and good behavior, that’s very legible and gives a feeling of purpose and firmness. Like a boss, in every way. Ink fans, great news. 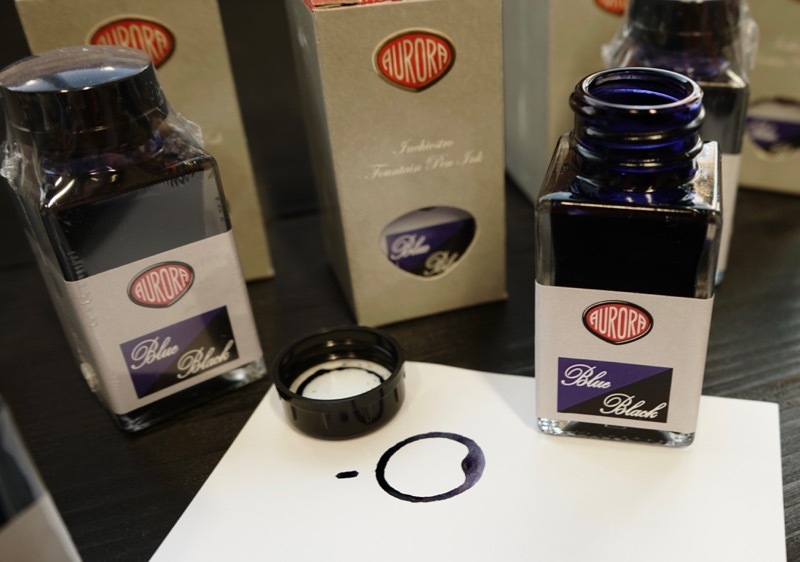 Aurora is bringing out a new ink: Aurora Blue Black. As you know, I’m a huge fan of Aurora pens, and also of their two inks. Aurora now offers Aurora Blue and Aurora Black, two excellent inks that I use often. In fact they are the only inks I’ll trust in my Aurora Optima demonstrators. Aurora inks flow well, look great and are safe and easy to clean. So what could be better than extending the Aurora ink line and adding a Blue Black? Nothing! Aurora Blue Black looks dark, and really appealing to me. If it has the same characteristics as its two parents, it should be beautifully behaved. I’m looking forward to it. I don’t actually know when Aurora Blue Black will be for sale. I’m not sure if this is public information yet. My Aurora dealer is Dan Smith, the Nibsmith, and all he would tell me is that he’ll have Aurora Blue Black for sale as soon as it’s out. Hey, though, one last thing. Feel free to post the news elsewhere, but if you do so, please do the fair thing: either link to this post or mention Fountain Pen Follies. That’s what I do, and I’d appreciate the same courtesy. I like to do a year-end accounting of what I bought, to keep myself honest, and to try to learn a little. Here’s what I’ve learned looking back at my 2016 fountain pen purchases: ouch. I bought 19 pens this year. They are all very nice pens. But I find the total number surprising, and excessive. Also, two of them are purple. Which is just messed up. June meant beautiful weather, and great pens and inks. Unfortunately the last week for me was taken over by non-pen things. So it’s a treat to look back at the pen things. 1. Aurora Optima 360 Monviso. Of course this beautiful pen is June’s number one highlight. This is my big purchase, probably for the year. Unless Pelikan strikes again. But ending the year with the Monviso would be just fine. It’s a great-looking pen, with a great-writing stub. 2. Montblanc BMW ink. Montblanc BMW ink is such a nice blue. And yet as far as I can tell, Montblanc isn’t selling it through the usual US dealers. That’s a shame. Hopefully that will change. 3. Parker Penman Sapphire. It’s true. Parker Penman Sapphire really is the top — the Coliseum, the Louvre museum, a Shakespeare sonnet and a Bendel bonnet. It really is all that. Just a beautiful blue ink. Alas, no longer available. 4. Fountain pen friends. I just happen to owe all of those good June experiences to friends. I’m pretty lucky. My Aurora Optima 360 Monviso comes with a factory stub nib, the first for me. It’s a very nice stub, showing a lot of line variation while still being easy to use. Since the burning question about the Aurora Optima Monviso limited edition seemed to be how it would compare to the Nero Perla, I thought I’d add a few more photos to those posted earlier. You’ll notice in some of the photos, especially when you look at the cap, how the Nero Perla appears to have a blue tint. That’s a trick of the light: the Nero Perla is just more translucent, so it reflects the color of the light more strongly than the darker Monviso does. It’s easier to see the differences between the pens with the Nero Perla in front of the Monviso. But let’s put the Monviso in front at least once. Finally, here are the Monviso and the Nero Perla bracketing the demonstrator. All three of these pens have a different capband. A hidden difference is that the Monviso is limited to only 360 pens, which is why I bought mine right away. The demonstrator is numbered, but there are many more of those — mine is number 1107. The Nero Perla is in the regular line.